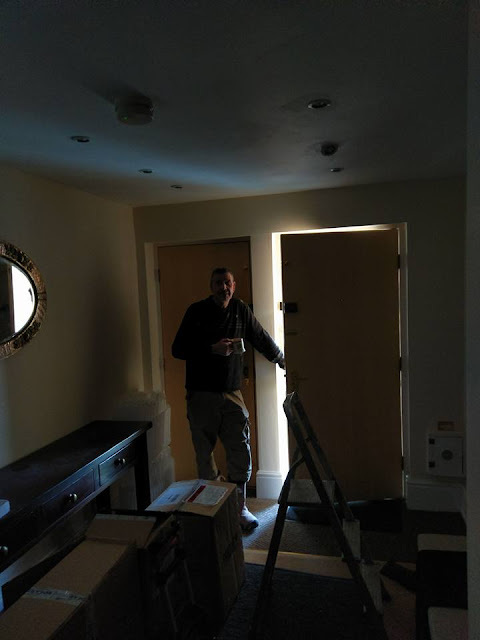 The entrance hall into our penthouse had no natural light, I could show you how it looked but it would just be a black screen though the installers of our solution did take a photograph with the door slightly open. We've fitted a sun tube, for the technically minded there are details here but basically we now have a little transparent dome on the roof of the building with a highly reflective tube running down through the roof void to our hall and the end is fitted with a diffuser in the ceiling. It is truly amazing how much light such a little opening gives, on a sunny day its almost too bright and we constantly think we've left lights on by mistake. The equipment took half a day to install, made hardly any mess, no not even dust, and we are delighted with the improvement. The second life enhancing change has been new double glazed aluminium windows in our two bedrooms. Previously we had distorted wood sash and case single glazed units that streamed condensation, got stuck if you opened them too far and had so much frame and architrave they let in precious little light. Now we have windows that open, have built in ventilation units, are constantly clear and show off our glorious views to perfection. Finally the new tiles to the balcony are finished and I've put out the folding dining table I bought a while back in the Habitat sale. It's perfect for a small space as it opens out fully to comfortably seat four or partially to seat two and the four chairs are stored underneath. We did sit out over the weekend just for coffee but it's cold again today, so much potential though, so much light and so much work that has been well worth the effort. When we bought the penthouse Mr FF complained it would be too dark, he's not complaining now. And in view of the ongoing home improvements, I've given my blog a little renovation too, I do like the extra large photographs which never seemed to fit on my previous template. What a fabulous transformation! We did think of fitting a light tube in the hall of our last (single storey) house, as any light came through open doors in the bedrooms and bathroom, but we never got round to it! Like the new look, with the bigger photos. A lovely renovation and I love the view you have!! I've heard of a light tube but not seen one in action before. It's incredible how much light comes from it!